Home Technology Tech Tips Do Mic Shield Block Noise Effectively? Do Mic Shield Block Noise Effectively? Also called sound shields, isolator shields, reflectors, and so on. They are used to block echoes. but they are not recommended for everyone. If the room is already well treated (has a lot of soft surfaces), you may not even need it. But if the room is poorly treated (has a lot of hard surfaces), a mic shield is not going to magically fix the problem. The issue with mic shields is that, while they protect the back of the microphone, they don’t fully protect the front and the sides. Many microphones are already designed to block noise coming from the back, and it’s noise from the other directions that are the problem. A mic shield does not protect from the sound waves which bounce from the walls behind you and then come back into the microphone. Nor will it protect against echoes from a ceiling or a hard-surface floor. 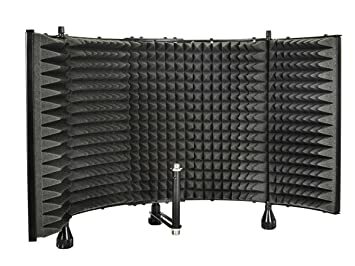 Mic shields have their place in a home studio that has decent sound treatment but wants to supplement some of the sound treatment that they lack. However, if you don’t have a treated room, your money may be better spent working on that first.